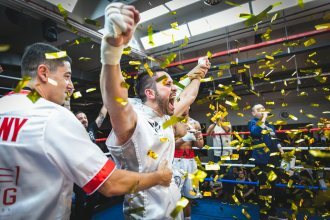 SINGAPORE, 13 April 2019 – Following a hard-fought eight-round matchup in the main event of The Ring Fighting Championship (TRFC) VI, France’s Abdelelah Karroum notched his fifth professional boxing win against Singapore’s Alexandrew David, to take home the World Boxing Council (WBC) Asia Silver Super Welterweight title. As expected, it was an intense battle with both David and Karroum going head-to-head for the full eight rounds in the final event of the night. Despite David’s strong start to the contest in the earlier rounds, Karroum held on and came back strongly in the second half of the matchup, especially in the final two rounds, to maintain his unbeaten fight streak and also earn the bragging rights as Singapore’s best Super Welterweight boxer. In the co-main event of the evening, Singapore’s Hamzah Farouk retained his WBC Asia Continental Super Featherweight title after a long-drawn battle over the full ten rounds against his experienced Thai opponent Paiboon Lorkham. Former Mixed Martial Arts Atomweight Champion Kirstie Gannaway notched her second professional boxing victory via a unanimous decision against Indonesia’s Nadya Nakhoir. Besides the seven professional boxing bouts where there were also wins for Singapore’s Efasha Kamarudin, Philippines duo Jeson Umbal and Mark Magsayo, and France’s Medi Boufoudi, there were also four amateur boxing matches, all of which were title fights. The first bout of TRFC VI was a rematch between Raihan Ibrahim and Jared Hoon for the TRFC Men’s Amateur Lightweight title, which Ibrahim once again took home after an end-to-end battle between the two. Despite going up against a lankier opponent in Josephine Soh, The Ring Boxing Community’s (TRBC) Tawee Tong Yu fought with a lot of heart, delivering powerful punches against Soh to take a unanimous victory and retain her TRFC Amateur Women’s Featherweight title. Brothers Velvan Tan and Velco Tan both managed to retain their TRFC Amateur title belts after securing unanimous victories against local Angus Ng and Algerian Almoataz Alrgebi respectively. It was once again a great display of boxing on, on both the amateur and professional front at the sixth edition of TRFC, which is sanctioned by the Singapore Amateur Boxing Association (SABA) and the Asian Boxing Council. It was yet another full house event, with 450 attendees present to watch the 11 fights on display throughout the night. For more information about TRFC or any of TRBC’s events, visit www.thering.sg.